Have you seen these stars show up on Google search results? 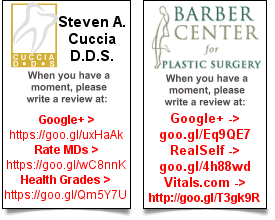 They are Google Reviews that people are placing on your business Google my Business page. As you can see below in my email signature, reviews are also an important aspect of YELP, Angie’s Lists, Bing and local YellowPages … but the most effective are reviews placed on Google my Business! 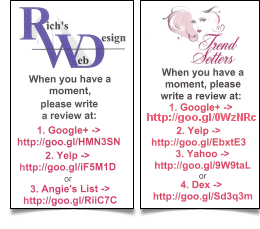 I have started to assist my clients in printing business cards w/ short URLs that direct customers to their own review pages. Vista Print is a very inexpensive and reliable service for these. Go to some of the short URLs ( for example –http://goo.gl/bvnVBb ) in these business cards and see. 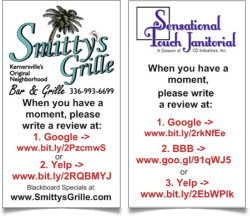 For Google Reviews, customers must also have a Google account in order to write a review. Customers need to post the reviews themselves, through their Google+ accounts. Customers can leave ratings without actually writing a review. The rating is just the “stars” without the text of a review. At least in terms of rankings, the number of reviews you have seems to matter more than the quality of those reviews. Best-practices for requesting reviews – Ask everyone for a review, not just your diehard, happiest customers. Point out as often as possible that you’d like your customers’ honest feedback. Don’t incentivize – Not only is it against the rules, but makes you look as though you’re desperate. Your customers care, not all of them, but that’s OK. Many will write a review if you ask and especially if you give them basic instructions as to how. Place a line on your email signature that guides people for reviews. Where have you seen this before?? ?